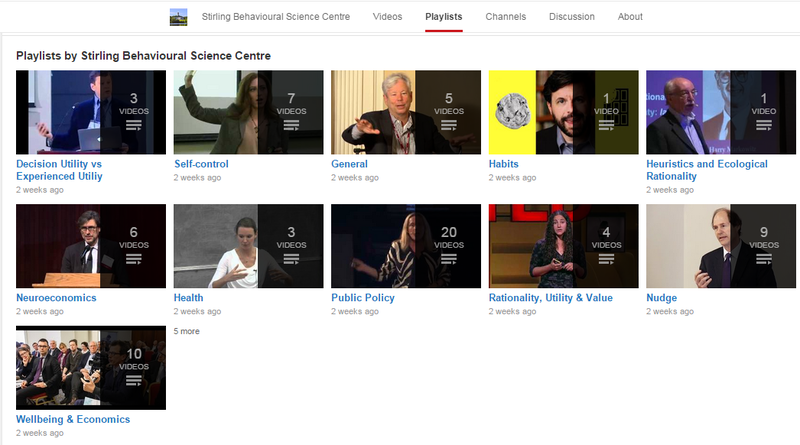 Stirling Behavioural Science Centre has launched a YouTube channel. Its purpose is to act as a curation service for interesting behavioural science videos, rather than to produce original content (at least for now). YouTube is replete with excellent talks by world renowned speakers in the field, including not only 10-20 minute TED style talks, but also lectures and Q&A sessions than can run into several hours. So far there are 9 playlists covering a few major topics but this will be expanded in coming weeks. Suggestions for videos or new playlist topics are welcome. Could you please provide direction about how to submit videos for consideration? Post them here, email me, or contact us on twitter @StirlingEconPsy.